It is the last remnant of the old village that stood on this site for anything up to a millennium and probably there was a wooden church on the same site before the Normans came and built in stone, for it was a village of importance in royal ownership well before the Domesday Survey was carried out. However, the Church is not just a historic monument, although it has fine architectural features and some outstanding memorials to the Blount family, it is a living document, altered and added to over its history and restored with care and dedication over the last twenty years or so. It is big for a parish church and surrounded by parkland, so it is a popular church for important occasions which have included over recent years not just marriages and thanksgivings but a confirmation and an ordination. 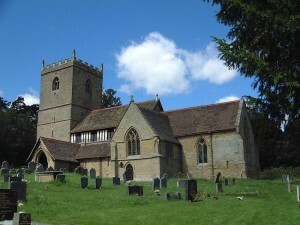 St. John’s is a part of the Cleobury Benefice and belongs to the Church of England’s Diocese of Hereford. Services are held in the church every Sunday on a monthly pattern. The first Sunday Holy Communion is held at 10.30 a.m. On the second Sunday there is a 6.30 p.m. Evensong – both these services accompanied by our accomplished organist. On the third Sunday we celebrate Holy Communion at 8.00 a.m. – a quiet and reflective early service – and on the fourth Sunday in the month the service is Evensong at 6.30 p.m. The services are traditional, using the Book of Common Prayer and there is an entirely up-to-date warm (new heaters have been installed) and friendly welcome for anyone who comes to join the regular congregation.